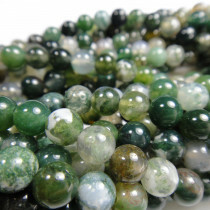 In ancient Rome Moss Agate was a talisman, believed to bring good fortune and the blessings of the deities In Europe it was called the "Gardeners Crystal" and was placed in fields and orchards as an offering to the guardians of the land. 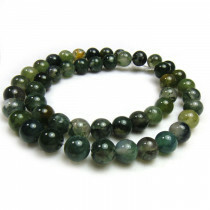 Moss Agate is believed to be a stabilizing stone connected with nature. Held to improve self-esteem and promote self-expression. A highly optimistic stone balancing emotions and reducing stress. 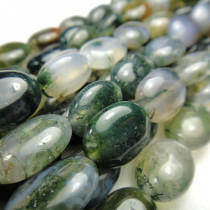 Moss Agate Round 4mm Gemstone Beads (~100pce Strand) - 40cm /16'" Strand. 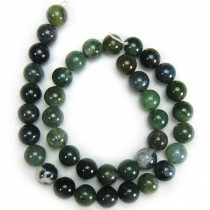 Moss Agate Round 8mm Stone Beads (~50pce Strand) - 40cm /16'" Strand. 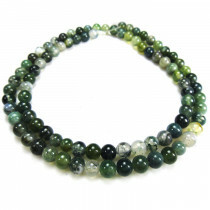 Moss Agate Oval Approx 12x14mm Gemstone Beads (~ 28pce Strand) - 40cm /16'" Strand.